Best Buy's stock takes a dive after announcing plans to shutter 50 stores in U.S. while opening 50 stores in China. NEW YORK (CNNMoney) -- Best Buy's stock took a dive on Thursday after the retailer reported quarterly results that included plans to close 50 big- box stores in the U.S. by 2013. The company said it plans to open the same number of stores in China during the same time period. Best Buy's (BBY, Fortune 500) stock price dropped 8% as the company's better-than-expected earnings report failed to trump the news about shuttering brick-and-mortar locations. The retailer reported an adjusted quarterly profit of $2.47 a share. That was significantly higher than the projected $2.16 a share, from a survey of analysts by Thomson Reuters. Best Buy currently has 1,105 big-box stores in the U.S., not counting the pending closures, according to company spokeswoman Kelly Groehler. In China, there are 185 stores under the company's Five Star brand, she said. The company plans to open 100 "mobile small format stand-alone stores" in the U.S. in fiscal year 2013. It also said 14 of the new stores in China will be "mobile store-within-a-store concepts." What's China buying from the U.S.? Groehler described the "stand-alone" stores as small stores located in strip malls and similar retail locations. She described the "store-within-a-store" as a small Best Buy store located within a larger Best Buy store. The company would not identify the stores slated for closure. Best Buy has struggled to compete in a market that has become increasingly dominated by online retailers like Amazon (AMZN, Fortune 500). 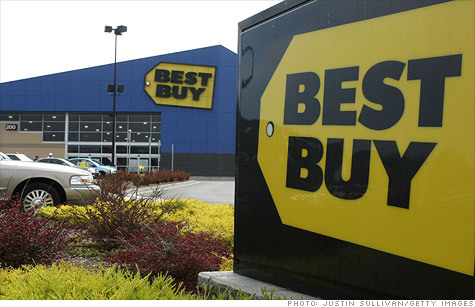 Best Buy said it was closing the stores to lower costs. The company projects $250 million in savings in fiscal year 2013. The company plans to save $800 million in costs by fiscal year 2015.